(Host) Vermont is a byway on this year’s election trail, but the political dialogue that grips the rest of the country is heard here too. Between now and Election Day, VPR will sample some political opinions in villages and downtowns around the state. In advance of tonight’s Vice Presidential debate, we ask about John McCain’s running mate. (Delaney) State Highway 104 runs south out of the political swing town of Fairfax and makes a big sweeping turn eastward toward Cambridge. On the inside of that curve is the Country Pantry, where Vermonters go to sharpen their appreciation for poached eggs, and for politics. Four years ago, Democrat John Kerry won 54 per cent of the Fairfax vote. Eight years ago, George W. Bush won the town by just 26 votes. 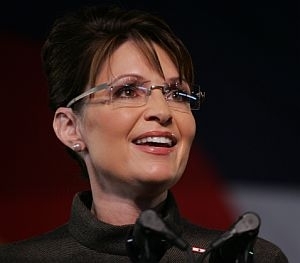 The economic crisis has pushed other issues into the background recently, but the selection of Alaska Governor Sarah Palin as Republican candidate John McCain’s running mate refuses to fade away, especially among Vermont women. Mickey Bonges has knocked on doors for Barack Obama. She is not a Palin fan. (Bonges) I almost thought it was a joke, at first, I don’t know, I was just so floored, that that was the choice, I couldn’t believe it, and then I guess, tactically it was a good choice, I don’t know. (Delaney) In the past, has the selection of the Vice Presidential candidate tilted you at all? (Bonges) No, no not at all, but I think that with his health and things, that this could be a consideration. (Delaney) The phrase "his health and things" refers to John McCain’s age, he’s 72, and his history of skin cancer. Those points do not seem to trouble people who think Governor Palin was a good choice. Adrian Irish is on the Rescue Squad, and he made up his mind long ago. He’s so certain of his choice that he says he has stopped listening to the campaign. (Irish) "I mean Obama’s got some good things, he’s said a few good things too. I don’t have anything against him, he’s a good candidate too. I just like McCain better. (Delaney) What do you think of the addition of Sarah Palin to the ticket, did that move you at all? (Irish) No it didn’t move me at all, didn’t move me at all, I had already made up my mind for McCain, before that. (Delaney) So the Vice Presidential thing didn’t tilt? (Irish) Didn’t tilt me, no. (Delaney) The vice Presidential thing doesn’t tilt a lot of male voters on this sunny morning at the Country Pantry, but the Palin Effect does seem to move women diners. Regina Meigs was born in Montgomery Center and now lives in Fairfax. Like most Vermonters, she was surprised to hear Sarah Palin’s name at The Republican convention. (Meigs) I mean it was like a shock, who the heck is Sarah Peelin, Palin, I can’t even pronounce it right. But uh, she was just like right out there in left field, I mean I’d never even heard of her before, um, and that concerned me as to who I would vote for for President, I mean, John O’Cain, John McCain is uh seventy two, and he has health issues, and if something happens to him in the next four years, we’re lookin’ at Sarah Palin to run the country, and she has no credentials whatsoever. (Delaney) Pro-McCain voters tend to dismiss the notion that his running mate has limited credentials to govern. Over her pancakes, visiting leaf-peeper Judy Sutter says Palin has, by her definition, excellent qualifications. (Delaney) Her critics are saying she doesn’t know anything to govern. (Sutter) I beg to differ with that. Because when you look at her experience versus Obama’s, I mean, there’s a big difference there. And I think that she could run the country, I don’t have a problem with that. (Delaney) At the Rescue Squad table, Kara LaCross is a firm supporter of the McCain-Palin ticket. (LaCross) "I think she’s fantastic. I like her a lot, I think it’s a shame she’s getting a lot of the flack that she’s getting, about her daughter being pregnant. She’s got her beliefs, she’s a strong woman, and I think it’s a great choice." (Delaney) The Palin Effect, as reflected in the breakfast buzz at this roadside restaurant, does not seem to bring new recruits into the McCain column in Vermont as much as it energizes those who are already there. But the experts have already put Vermont in the "blue state" column, and they expect a lot more energy for Barack Obama. For Vermont Public Radio, I’m Steve Delaney in Fairfax. (Host Outro) The Vice Presidential debate is at nine o’clock tonight and will be live on VPR.